Mentioned in 1858 Melvelle's Directory and active in 1874 and in 1881 when purchased by Kingsford and Company for £1,100. It was claimed by the Compensation Authority in 1923. November that year saw George Beer and Rigden pacified with £802.10s. The tenant received £200. It closed on 29 December that year and the premises continued as part shop and part dwelling. From and Email received, 29 April, 2010. I am trying to find any more information please on the husband of my great aunt, Frank Hignell who was the licensee there when he died in 1922. (His death certificate states) his wife was Harriett Catherine Hignell, yet when I looked at your website I see there was a Harriett Catherine Lynx there from 1923 to 1932, and a Harold Lynx!!! This is rather mysterious to us, have you any more details please? We know that Harriet remarried again in 1934 in London, but that was to a Charles Hudson! Any clues you might have would be great please. I see there was a ship called Lynx in Dover at that time! Perhaps she took that name along with Harold!!! It's a real mystery, many thanks. Hope you can help. Above photo taken in Bench Street, Dover it says on the back. Could well be outside the "Providence Inn. 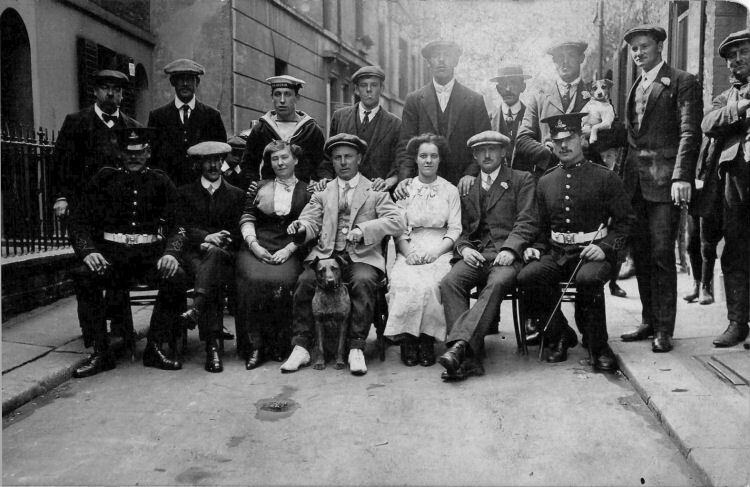 Harry Lynx (or Frank real name) and Harriett are in the middle with the dog, think they might have been in their late 40s, or early 50s, then in Dover. Circa 1918. Permission to repair war damage was refused in 1947 and it was taken down in 1951. South Eastern Gazette 20 June 1848. PUBLIC HOUSE, DOVER, TO LET. The Premises are situate close to the Harbour and Railway. Coming-in about £240, part of which might remain on security. Apply to Mr. Skinner, Appraiser, Chatham; or to Mr. Thomas Williams, the "Providence Inn," Dover. From the Dover Express and East Kent News, Friday 22 February, 1881. 1d. The “Providence Inn,” Trevanion Street, was sold by auction by Messrs. Terson and Son, of Castle Street, at the “Shakespeare Hotel,” on Thursday last, at the excellent price of £1,100. Messrs. Kingsford Brothers, securing the property after a very spirited bidding. From the Dover Express and East Kent News, Friday, 1 March, 1901. Price 1d. William Horton was charged with stealing from the till of the “Providence Inn,” Trevanion Street, a sum of money, the property of the landlord. Joseph Heron, landlord of the “Providence Inn,” Trevanion Street, said that he was in the bar on Saturday afternoon about 3.25, and the prisoner, who had been in the house half an hour was on the other side of the bar. Witness had to leave the bar, and on his return he found the till partly drawn out. The prisoner was standing up against the counter. Witness put the till back and said nothing to prisoner. He went into a back room and watched the prisoner. He leaned over the bar and pulled the till out, and put his hand in it. Witness ran into the bar and said, “What do you mean by this?” Prisoner had then withdrawn his hand and jumped back. Witness sent for the Police and detained prisoner until they arrived. Prisoner said he had done nothing. Witness could not see how much prisoner took. There was over £2 left in the till. On the way to the Station he pulled some money out of his pocket and dropped it in the road. He picked it up again. In Maison Dieu Road he offered to square it. Witness thought the prisoner had taken about five or six shillings. There was another man in the bar when witness saw prisoner take some money out of the till. Arthur Lawler, a workman at Messrs. Pearson and Son's, said that when he went into the bar of the “Providence Inn” the prisoner and the landlord were there. The latter went out, and the prisoner leant over the bar. Witness could not see what he did, but he heard the till come out and heard the money rattle. The landlord then came out, and accused the prisoner of stealing some money. Police Constable MacManus said he was called to the “Providence,” and the landlord gave the prisoner into custody. On the way to the Station the prisoner dropped some money, but witness made him pick it up. He offered to square the landlord. When the prisoner was searched £1 7s 2s. was found on him. Prisoner strongly denied the charge. The Magistrates fined the man £1 including the costs, or 14 days' hard labour. From the Dover Express and East Kent News, Friday, 28 August, 1903. Price 1d. On Sunday evening Mr. James Henry Meadows, the landlord of the “Providence,” Trevanion Street, whilst walking down the Admiralty Pier with his little daughter, was seized with a fit, falling with considerable violence on the ground and striking his head. He recovered somewhat from the attack, and got, with assistance, as far as the “Royal Hotel,” Clarence Street. He was then seized with another fit. From this he never recovered consciousness, the fall in the first case having injured the blood vessel of the brain, and the haemorrhage from them causing unconsciousness, and, ultimately, at the Hospital, death. The inquest was held at the Town Hall on Monday afternoon, by the Borough Coroner, Sydenahm Payn, Esq. Mr. E. Beer was the foreman of the Jury. Caroline Meadows said that she lived at the “Providence,” Trevanion Street, which was kept by her husband, the deceased, James Henry Meadows. He was 32 years of age. He went out on the previous evening at 6.30. he had not been very well for a day or two, but seemed all right then. He took their little girl out with him, saying he was only going on to the Sea Front. About seven o'clock she was told that her husband had fallen down near the “Lord Warden.” When she got there they were just bringing him out of the “Royal Hotel” on the ambulance. He appeared to be unconscious, and was taken to Dr. Best's, and afterwards to the Hospital. Witness remained there until two o'clock that morning. He was then quite unconscious, not having spoken. Emily Meadows, the daughter of the deceased , 7 years of age, said she went with her father for a walk after tea. They went down on to the Admiralty Pier. They were looking at the ships when he turned round and suddenly fell down. The witness, who, owing to her youth could only answer a few questions, said that she did not think he fell down over anything. He fell backwards onto his head. Maud Oldham said that she was staying at 8, Eastbrook Place on a holiday. On the previous evening she was on the Admiralty Pier, just coming off. She heard a noise and a scream, and saw the deceased, whom she had just passed, lying on the ground. The fall seemed to be a very heavy one, and the head seemed to have knocked on the ground violently. She went to his assistance. He was writhing on the ground, and groaning. He seemed to go blue in the face. Someone had brought water, but his teeth were clenched, and they could not get it down. Some men carried him to a Bench, and he seemed to come to a bit. He eventually did so, and walked, although he did not appear to have fully recovered. Witness went to his assistance, and a gentleman also gave a hand. They took him off the Pier, but at the “Royal Hotel” he fell again backwards. A crown assembled, and witness left him, taking charge of the little girl, who took her to the house, and she informed Mrs. Meadows. When he fell outside the “Royal” he seemed to become stiff first, and his arms drew up. He would have fallen heavily but for the fact that witness and the gentleman had hold of him. Inspector Baker said that about 7.30, whilst in company with Sergeant Green, his attention was called to the deceased. He found the deceased on the floor of the smoking room being attended to. Witness rendered first aid, and waited a little time expecting him to recover. Finding he did not, witness put him on an ambulance and took him to Dr. Best's. Whilst Dr. Best was examining him the last witness told him of the fall. Dr. best ordered his removal to the Hospital, where he was taken, still in an unconscious condition. There was no outward appearance of any injury, but he seemed to be suffering from an epileptic fit. Mr. Ivan Cochrane Keir, House Surgeon at Dover Hospital, said that he was present when the deceased was admitted between 8 and 9. he was unconscious, and in a state of convulsions. He was put to bed and examined. He found a large swelling on the back of the head, but could find no sign of fracture, nor was there any bleeding at the ears, etc. he became quieter after three quarters of an hour, and became more profoundly unconscious. He died just before four o'clock. The nurse said that a few minutes before he died blood came from his nose and ears. Death was due in witness's opinion from haemorrhage on the brain, arising from injury caused by the fall occasioned in a fit. A verdict of Accidental Death in accordance with the medical Officer's evidence, was returned, and the Jury also expressed their thanks to Miss. Oldham for her assistance. From the Dover Express and East Kent News, Friday 8 January, 1909. Mr. Rurley Mowll applied for the temporary transfer of the licence of the "Providence" public house, Trevanion Street, from Henry Downton to Arthur Fraser. He said the reason of his appearance was that the nine months fixed period by the Bench as the minimum period of tenancy before a transfer would be granted had not elapsed in this case. Unfortunately, the tenants wife had not been at all well, and he produced a medical certificate from Dr. Canon to the effect that she was suffering from nervous prostration and her state of health was much as to unfit her to keep a public house. It was never intended that the rule should be absolutely hard and fast, and he thought the Magistrates would agree this was a case in which it might properly be allowed to lapse. The bench granted the application, the police stated that during Mr. Fraser's tenancy of the "Bell," St. James's Street, the house was well conducted.